I think this will be the last bit I’ll post to ITM, at least in this round of sharing. A bit of a roadmap of what comes between my most recent post and this one: after the dry death/wet death thoughts, I do the obligatory summary of the Disputation and briefly present the standard, moral reading, which, you know, aims to accurately duplicate the poem’s original interpretative possibilities: disdain the world for the sake of heaven, etc. etc.. And that’s fine! (or maybe it stinks?) Let a thousand (wormy) flowers bloom. 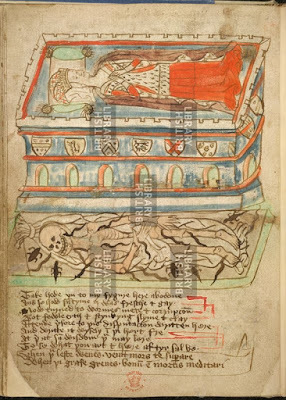 The first of the Disputation‘s four illustrations resembles a fashionable late medieval “double” or “cadaver” tomb, and so works perfectly within the contemptus mundi tradition. Classic English examples of these monuments, virtually contemporary with the Disputation manuscript, include those of Bishop Richard Fleming (d. 1431) at Lincoln Cathedral and of Henry Chichele (d. 1443) at Canterbury Cathedral. The top of a typical double tomb display the body as it appeared in the prime of life, dressed in its institutional regalia or otherwise elaborately clothed, lying as if in sleep; in a lower level, the tomb shows the body as an emaciated corpse, naked or barely draped with a shroud. On the upper level, then, the tomb shows the perfected future body of the resurrection, or the entombed subject’s ideal imaginary (in a Lacanian sense) selfhood in the pride of its worldly life; below, the tomb represents the fraudulence of any beauty in this mutable world. Some funerary art went still further by displaying the corpse putrefying, with entrails exposed, swarming with toads, snakes, and other vermin. Some even eschewed the idealized body altogether, displaying only the rotting corpse (again, see Kathleen Cohen’s indispensable guide). Those who encountered the tomb were meant at once to admire the dead, to speed them through purgatory with their prayers, and, piously disgusted, to think on their own impending deaths (so says Pamela King). Drawing on and perfecting this tradition, the Disputation‘s manuscript shows a lifelike, beautiful tomb sculpture while, at the same time, impossibly displaying the tomb’s rotting contents, around which cluster worms and other vermin. The Disputation itself includes a typical cadaver tomb verse on this very leaf (see above) by directing the reader, in the first two lines, to “take hede vnto my fygure here abowne / And se how sumtyne I was fressche & gay / Now turned to wormes mete & corrupcone” (take heed of my figure here above, now turned to worms’ meat and corruption), and in the final lines, encircled with a banner, “when þou leste wenes, venit mors te superare / when þi grafe [sic] grenes. bonum est mortis meditari” (when you least expect it, death comes and overcomes you; when the grass is green, it is good to have death in mind). The tomb may represent a woman in the pride of her life–admired by the world of her peers, feared and hated by monks, and scorned by God–but she has seen fit to make advance arrangements to have herself speak, through her tomb, the most properly orthodox sentiments about worldly contempt. This is thus a tomb that, like other cadaver tombs, simultaneously announces a contempt for worldly existence while demanding that the subject be remembered; this is a promise that this self and the ones watching it will come to nothing that also maintains the self’s power to speak significantly as a moral authority. The self-abnegation of the cadaver tomb negates the negation by more firmly preserving the self against death’s oblivion. Far from giving the self entirely over to death, cadaver tombs instead grant the human as much perpetuity as this world offers (not least of all because many of them were made of stone!). Therefore, cadaver tombs and other medieval death art, for the most part, operate like anthropophagy narratives, which, by presenting anthropophagy as especially horrific, simultaneously enfold human death within ethical frames and, through significant silence, exclude the deaths of nonhumans from ethical significance (me!). Such deliberate humiliations preserve the self as self simply by letting the self decide to be humiliated; the self of self-abandonment remains its own responsible agent. Dispossession in this case is therefore a mode of continued possession. Rosemary Woolf terms this and the following, similar lines “perhaps too repellent in content…to deserve inclusion in any anthology” (318), but what should have struck her was not the repulsiveness but rather the anaphora: “mi riggeboon,” “min eiyen,” “mi guttis,” “my teeth.” The performance of dissolution, a deliquescent striptease, is not an instance of the “cosmic horror” of Lovecraft–much loved by the new materialists–in which we confront the “anonymous, impersonal ‘in itself’ of the world, indifferent to us as human beings” (Eugene Thacker, In the Dust of this Planet, 17); nor is this an eruption of the “shapeless, mucous stuff of the life-substance” of the Real into the pride of the Symbolic. The repulsion of “My lief life” does not let itself out into or even past the furthest reaches of repulsion, since the repetition of the possessive pronoun in each line holds on to the body as human, as belonging to a speaking, singular subject, though the operations of the grave should undo it utterly. Here as elsewhere, the human body, whether idealized or hideous, remains the cynosure. As with cadaver tombs, any hungry vermin move through the body’s flesh or rest on top of it, or they orbit it as a kind of creeping halo. Focused on us, the vermin are as much of secondary importance to our existence as the pair of faithful dogs (here’s one; here’s another) so often serving as footrests for the central, human bodies of medieval recumbent tomb sculpture. By contrast, the remaining three illustrations of the Disputation forsake anthropocentrism altogether, demanding an interpretation of the poem far less faithful to the interpretative traditions of medieval death poetry. 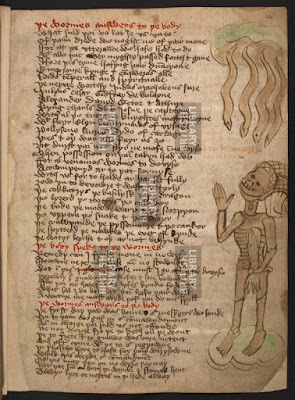 The corpse and the worms are figures, as the dreamer explains, “strangly ilk one oþer corespondynge” (27; each one strangely alike the other), each engaging the other “in maner of a dyaloge” (28; in the manner of a dialogue). Here, humans have met their match; surprised to be engaged in a dialogue–or something like a dialogue–they have been dislodged from their presumption of centrality and singular agency. The illustrations (see my last two worm-posts for the other two) show an emaciated corpse standing, its face a skull, marked as a woman by its fashionable head-dress, and, depending on the illustration, either looking down or up at four worms, all as large as one of her limbs, and all with a single black dot perhaps representing an eye. In the illustrations, as in the text of the poem itself, the worms are the corpse’s equal or even superiors, another set of beings, interested in but not secondary to her. While the eye gives them just enough of a face to be able to address her, their featurelessness otherwise refuses anthropomorphic appropriation. Their presentation as a crowd of four “mawkes” (112) rather than an individuals—note that only the maggots are plural among the poem’s list of 19 grave animals—is just as much a refusal: as a hungry, speaking group, they are indisputably alive, but as a swarm or pack, they evade personalization, refusing to mirror back to us our pretensions to singular selfhood. 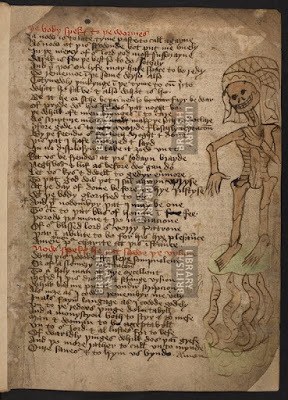 The corpse protests by citing scripture, “bot ȝit in the Sawter Dauid says þat alle / Sal be obedyent vnto mans calle” (140-41; but, still, in the Psalms [i.e., in Psalms 8:7-9] David says that all shall be obedient to man’s complaint). The worms counter, “Þat power dures whils man has lyfe…now þi lyfe is gone, with vs may þou not stryfe” (142; 144; that power lasts only while man has life; now your life is gone and you may not struggle with us). Repulsed and harassed by their “gret cruelte” (82; great cruelty) and unconquerable appetites, the corpse cannot spurn the worms as she should have spurned worldly delights. She certainly cannot extend her protection to them in mercy, acting as the ethical subject of animal rights, which fosters charitable human agency for the sake of helpless animal victims. And she cannot attempt to construct herself as human by subduing her harassers, because humans’ divinely promised mastery has been revealed as only ever temporary and partial, doomed to failure. In short, she cannot escape her own materiality and thus her own useful availability. The surfaces of living beings are envelopes and filters, thick regions where complex chemical transfers and reactions take place….At a microlevel, it becomes impossible to tell whether the mishmash of replicating entities are rebels or parasites: inside-outside distinctions break down. (Morton, The Ecological Thought, 36). Similarly, Jane Bennett glosses an observation that “the bacteria in the human microbiome collectively posses at least 100 times as many genes as the mere 20,000 or so in the human genome,” with “the its outnumber the mes. In a world of vibrant matter, it is thus not enough to say that we are ’embodied.’ We are, rather, an array of bodies, many different kinds of them in a nested set of biomes” (112-113). Matter, vulnerable, temporary, and always sliding towards dissolution, breeds worms, which is to say, a host of abysses perforate it; as Isidore of Seville explains, worms “are generated in putrid meat, the mothworm in clothing, the cankerworm in vegetables, the wood-worm in wood, and the tarmus in fat” (XII.v.18, Barney et al., trans.). And. FOLKS, if you’re still with me, this is as far as I know what to say. I know I’ll have to do more about abysses, then say something witty and helpful about the ethics of flat ontology, and then vainly CMA by dutifully apologizing to the traditional readings that cluster around British Library, Additional 37049, and finally offer another nice worms’ eye view. But for the love of Pete, I just don’t know how to end the last paragraph! This probably means scrapping the last two graphs and rebuilding them, and maybe digging for inspiration in Gillian Rudd’s Greenery. Today I offer my essay’s introduction (first draft!) with the hope of providing the next section tomorrow or Friday. The bulk of the rest of the essay will be a discussion of “A Disputacion Betwyx þe Body and Wormes” (IMEV ref.) (text and translation), largely, I think, through a close appreciation of the poem’s three illustrations of the body’s conversation with its worms. Feb. aim: Pervert medieval death/worms poetry by reading it amorally/ecologically. Not memento mori, but reminder that we’re all food. 5k words and a March 1st deadline says I can do it. [next comment] My task is to write an essay on “abyss” for a special issue on ecomaterialisms. I’m thinking the word right now in terms of mise en abyme, in this case, appetites within appetites within appetites, not infinite–because nothing’s infinite–but very large, and acentric, the closest thing absolute immanence offers by way of infinity. [next comment] Here’s the cool thing about taking ABYSS as MISE EN ABYME: this is a DEPTHLESS ABYSS, not one that promises chthonic secrets or surging secrets from below but rather FLATNESS, ONTOLOGICAL EQUALITY. Death is life for another. I don’t mean that life will conquer death, that death will come to a stop, as in Paul’s “Death is swallowed up in victory. O death, where is thy victory?” (1 Corinthians 15:54-55). Rather, death means the flourishing of others, swallowers who are not an abstract victory but rather a material swarm of worms and other vermin, who will also be swallowed by certain birds, “wormes corrupcioun” as Chaucer’s Parliament of Fowles puts it: a meshwork of appetite in which even the agents of corruption, the supposed ultimate eaters of the grave, will themselves be food in turn. If worms are food too, there is no one victory over death, but rather as many victories–and as many defeats–as there are appetites. The editors tasked me with writing about “the abyss.” I thought immediately of death, the “deepest pit” according to Job 17:16, where, as one twelfth-century poem has it, the dead “ceciderunt in profundum ut lapides” [fall into the depth like stones]. In this imagery, death is a deep hole, a channel leading perhaps to rebirth–as Jonah experienced when he emerged from the whale’s gullet–or to hell’s absolute darkness or hell’s mouth, a site of constant eating and cooking, most notoriously, or hilariously, in Raoul de Houdenc’s Songe d’Enfer, where “sinners are cooked in an endless array of dishes, pulverized, marinated, skewered, stuffed, larded, fried in butter and sauced with the traditional sauces of medieval cookery — green sauce, hot sauce, Parisian sauce, Poitevin sauce, and more often than not, garlic sauce” (17). This is a singular abyss, one perhaps with many entrances or, if you like, many mouths, but still finally one, dreamed up to horrify humans, or dreamed up out the horror of individual humans at the loss of their own subjectivity or foundation. This abyss is the one great mouth that will swallow us all. I would change only the implicit solemnity or grandeur of de Quincey’s formulation. From the perspective of the the subject being swallowed up an abyss, of course the abyss is grand; but the swallowing abyss may think little of what it consumes, and it may itself feel not so grand, so immeasurable, so abyssal. For it too will be swallowed up. Each abyss is subject to the appetites of other abysses. No abyss is final. De Quincy’s vision of abysses swallowing each other, without end, center, and certainly without reference to one final great abyss–death, Hell, or something even deeper–thus presents abyssal appetites as a kind of mise en abyme of appetite and vulnerability or even just availability. Here, mise en abyme, a term famously borrowed by Andre Gide from medieval heraldry, should not be understood as describing internal duplication (the “play within a play”) or infinite iteration (as with an object placed between two mirrors); it should not be understood, in a postmodern, correlationist manner, as a trope of foundationlessness or the inaccessibility of any final guarantee of meaning. Here, as much inspired by the worms of death as by de Quincey, I mean mise en abyme in a materialist, nonanthropocentric, ateleological sense, as a way of acknowledging that no one appetite has final priority, and that nothing escapes the condition of vulnerability to others, a condition Derrida so usefully called the “nonpower at the heart of power,” the “not be[ing] able” to elude being made use of by others. I will develop this idea in more detail below, but what must be done, first, is to argue against death being life’s end….